SES Foam is proud to announce its latest development 0.5/lb foam which passes 377 appendix x uncoated. In addition to this superior performance in the appendix x test SES also has what we believe is the highest bio-based content of any spray polyurethane on the market other than SES Foam own 1.0/lb product. SES Foam coupled with their high quality contractors can assure your project is done correctly with this new technology. This new high bio-based content 0.5/lb product contains over 15% bio-based content in the finished foam. This is extremely high most polyurethane foam products cannot achieve this value in the resin let alone the finished foam. Our values were obtained from ASTM-6886. 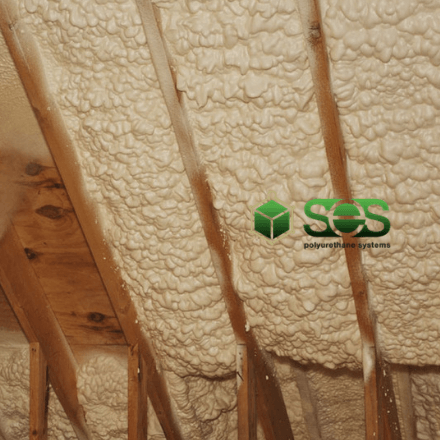 SES Foam’s 0.5/lb product is a true polyurethane with the high insulating properties you expect from polyurethanes including air sealing capabilities with high flow rates to ensure every nook and cranny are closed to provide you with an extremely tight building envelope. Couple this ability with our high quality contractors who can assure that the product is applied correctly and that the application meets the requirements of your structure. All SES Sucraseal documentation, manuals and resources available HERE.